Well, something like that. The formula is actually much longer, but that’s a good start. Your dog’s behavior is directly effected by the things that go on around him, things that have happened to him in the past, and his overall health and well-being. So, what actions can I take to prevent bad behavior in my dog? There’s lots of things you can do! Throughout the pages in this site I’ll be discussing many ways in which to keep your dog both mentally and physically happy…….with great benefit to you, of course, because a happy, healthy dog makes for a well behaved dog! For example, if your dog is well exercised for the day, chances are he will happily sleep away most of the rest of the day. In contrast, if your dog is feeling cooped up due to lack of exercise, he may find his own source of entertainment by chewing up your brand new pair of shoes. It’s important to note that in order for your dog to display good behavior he will require a strong balance of discipline, physical and mental stimulation, and be kept in good health. Did you know that your dog needs discipline in order to be happy? It’s true! One look into those big puppy dog eyes and your heart goes to mush, and I know how difficult it can be to reprimand at times like that, I’ve been there! But, you need to take on the role as leader of the pack! Certainly you don’t want your dog to take on that role. Dogs are very smart, and if you’re not a strong leader by providing him with consistent discipline, your dog will have no problem overruling your commands whenever he feels like it. He relies on your leadership to show him the way in what is expected of him, and only then will he fully understand, and be on his way to being a well-balanced, well-behaved, and happy pup! Interactive dog toys. These are great for when you are home, but some can be utilized for when you are away too, making them great for the dog who finds mischief the second you walk out the door. Kong toys. This is a sturdy, rubber toy with a hollowed out center to allow for the stuffing of wet and/or dry dog treats. Your dog will need to work at getting the treats out through a small opening, and it keeps them busy (and happy!) for long periods of time. Teach him new tricks. Don’t stop after the puppy years. Yes, you can teach an old dog new tricks! Try teaching him an easy trick, such as a high five, or something more complicated, such as putting his own toys away. Play a game. We play a game with our dog where we hide a treat, and he finds it using his sense of smell. He gets very excited and knows exactly what he is supposed to do. Start out easy, then get a bit harder, praising him on his success. If you like to walk, or jog, take your dog with you. Play fetch, or tug of war. Set up a doggie play date with a friend, or neighbors dog. Or, a dog park (if you have one) works wonders for releasing your dogs energy. Take your dog to an agility course, or build one yourself (it doesn’t have to be elaborate, use some obstacles that you can make him run around and through). Teach your dog to use your treadmill. If you have a pool, let him swim, or use a lake that is safe for swimming. Of course, like humans, every breed of dog is different than the next. And within every breed, each dog has a personality unique to him. Some possess personality traits that aim to please humans more than the next, making them easier to discipline, and train. Some need more exercise than others. And some will require a special diet due to health restrictions. You can figure out the correct balance for your dog by observing his actions and behaviors, and getting a veterinarian’s input as needed. If you’re in need of some help, please look through the pages on this site where you will find tons of information on behavioral issues within dogs. And, please feel free to leave a comment if you have any questions! Second, this topic is AWESOME. I think it is a question a lot of pet owners have and you provided a lot of value and information for anyone seeking help in disciplining their dog. Finally, your copy, or style of writing, is great. I can hear a voice through the words and that makes for a great post. Thanks so much for your comment Roxana! The Pyrenees is a beautiful breed! I’m sure she’ll enjoy the ‘hiding treats’ game. Thanks for commenting! I love this article. It is so important to know the nature of the breed of your dog. Cleopatra is a shih tzu and does not require a lot of exercise however I can tell if she does not get her morning and afternoon walk. Teaching her to walk on my treadmill has been the best thing especially in winter when the days are shorter or we are experiencing a lot of rain. She actually really enjoys it and is so proud when we have done our 10 minutes. It is a great backup. A happy health pet = A happy family. This is some great information that I need to pass onto my daughter. She has had several pets over the years, but she can never seem to learn how to get them to behave. The last one she had chased her little sister out into the middle of the road trying to play with her, but hurting her instead because he kept jumping on her. Thanks for the tips on how to get her dog to behave. I could not have found your article at a better time. My kids will be getting their first puppy this weekend. This site will do wonders in helping to make sure we get things off on the right foot. I’m so excited about the new member of our family and for having found your site. I own huskies my male has parents that are sled dogs. Can you train huskies to not pull your arm off when walking them? Or is it just part of their nature and I have to just live with it? Ah, yes, dogs do a great job at living up to the things they were bred to do, and Huskies certainly are no exception…they are great at pulling! Unfortunate for you as I’m sure you would love to keep your arm in your socket where it belongs. 🙂 It’s possible to get them walking nicely, but with dogs that tend to pull it just takes a bit more effort and patience with training. My dog was a terrible puller, and crazy as it sounds, when I was training him to walk on a leash, I would exercise him prior (get him running by throwing a toy). It helped to relieve that pent up energy so that he would listen better when training him during walks. Perhaps that could work for you? I also made sure my dogs pulling never resulted in getting him to where he wanted to go so he didn’t learn that pulling works. And I taught him impulse control…basically to “wait” until I said it was ok before he shot through the door, or through the gate. As a pet parent of a border collie, let me add an amen to your post! My dog was getting in trouble a lot until I realized that it was me causing the problem. Because her breed needs lots of physical activity and stimulation, once I kept her more active I no longer had behavior problems with her! I now take her on walks and runs with me. I play fetch with her and keep her more stimulated than I used to. No more behavior problems! It’s amazing how quickly certain behavioral problems can be fixed just through exercise alone, isn’t it? And, such an easy fix too! I’m glad to hear your Border Collie is doing much better. I once bought a dog for myself and the funny part of it was that one day when I went to sleep I left my shoes outside and to my surprise when I found my shoes not where they normally were, and decided to hunt for them, I found out they were taken by the dog. 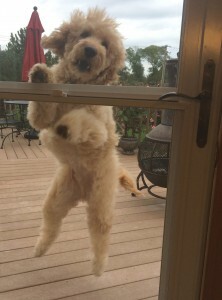 Yes, dogs can be little thieves. Mine often goes “shopping” in my daughters room for stuffed animals. Hello here. Thanks for informative article how to deal with dog which do not behave. I guess that telling him( dog), that he is bad, will not help. Of course dogs are smart and they understand many if our words, they need more as words. Dogs are pack animals. If we do not show who is the boss, we can suffer more as your mentioned pair of shoes. Overall everybody who has dog needs to have knowledge how to deal with them. Your article shows how to do it.